The state of Minnesota is well-known for having an educated population—only one other state has more adults who have earned at least an associate degree in college. But more students in the state are waiting to earn their college education until later in life, in favor of working straight out of high school. For students who are ready to go back and earn their college degree in Minnesota, online programs offer flexibility to learn while also working and taking care of family commitments. This page provides helpful resources and answers commonly asked questions about online college costs in Minnesota, helps students sort through transfer credit confusion and see how much they could make by earning a college degree. Minnesota is home to over 200 colleges and universities. As of 2016, there were over 250,000 students enrolled in the state’s public colleges plus 170,000 more enrolled in private colleges. While many Minnesota students choose to attend college close to their hometown, online learning makes physical distance less of an issue, opening up new opportunities for students in rural areas to earn the same, high-quality education as their peers in larger cities. 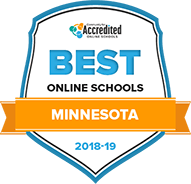 Check out our list of the Best Online Colleges in Minnesota for insight on which campuses are providing the best mix of quality online curriculum and student support. The University of Minnesota Twin Cities is a public research university in Minneapolis with fully online certificate and test preparation programs, as well as one blended bachelor's degree in multidisciplinary studies. Distance learners in this bachelor's degree program choose three out of five specialty areas to help configure their degree. You can select from applied, technical, and professional, arts and humanities, communication, history and social sciences, and science and health science. Designed for transfer students who have already earned 50 credits or more with a minimum 2.5 GPA, you can finish this 120-credit degree program in as few as two years. Part-time students taking two courses per term can finish in five years. Some U of M graduates with this degree secured positions as executive directors, project coordinators, content strategists, and systems engineers. Distance learners at Winona State University can earn graduate certificates and bachelor's, master's, or doctoral degrees entirely online or in a hybrid format. Online options for undergraduates include business education, healthcare leadership and administration, and a flexible individualized studies program. Winona State University's online graduate curriculum focuses on educating clinical specialists in various roles in the nursing field. Nurses can earn graduate certificates in Adult/Gerontology Acute Care Practitioner, Clinical Nurse Specialist, Family Nurse Practitioner, and Nursing and Organizational Leadership. The Doctor of Nursing Practice and Psychiatric/Mental Health Nurse Practitioner require 74 credits to graduate and prepare you to sit for the PMHNP certification. At Bemidji State University, you can pursue certificates, bachelor's, and master's degrees in online or blended formats. For students working toward a degree in a hybrid format in their Twin Cities program, Bemidji State offers a satellite campus in the Minneapolis/St. Paul metro area. Education options in this scenario include a bachelor's degree in elementary education, post-baccalaureate licensure in secondary education, and RN to BS nursing program. This public state university also offers several traditional bachelor's and master's degrees entirely online, including accounting, management, English, mathematics, and special education. Graduate students must complete their degrees in seven years or less, or their credits expire. All students pay the in-state tuition rate. Students can transfer credits to Bemidji State if they fall within the statewide Minnesota Transfer Curriculum and can apply to their major. Bethel University is an evangelical Christian, liberal arts institution in Arden Hills, Minnesota. Distance learners can choose from fully online bachelor's programs such as Christian ministries, alcohol and drug counseling, and human services. Graduate degrees are also available online, including Master of Education programs, MBAs, nurse-midwifery, and strategic leadership. You can also earn religion degrees online through Bethel's online Seminary program. As a Christian university, distance learning and on campus instruction are rooted in Biblical values and faith and work integration. The University of Minnesota-Crookston is a four-year institution, established in 1966, and one of five campuses in the University of Minnesota System. Online students can earn bachelor's degrees and certificates in fields such as accounting, finance, management, and entrepreneurship. Coupled with one of several minor degree options of your choosing, you can configure an online degree that best fits your academic needs and career interests. Distance learners pay the same tuition costs as in-state students. To be eligible for graduation, transfer students must complete all major requirements, including a minimum of 30 semester credits, with their last 20 credits at UMC. Established in 1947, the University of Minnesota-Duluth features a distance learning program with fully online and blended degrees and more than 2,000 courses. UM has a "primarily online" degree category, wherein students complete at least 80 percent of their instruction online. This format includes a required two-week, on campus intensive session during the summer. As a distance learner, you can earn bachelor's degrees in traditional fields such as marketing, management, sports and recreation management, and international business. Graduate degrees in a dozen fields, including dental hygiene, health informatics, and family education. At UM, you can also earn a teaching license in reading or a parent and family education license. The College of St. Scholastica is a private college in Duluth, Minnesota that offers synchronous courses for a variety of undergraduate and graduate programs. Using the Zoom virtual classroom, distance learners at St. Scholastica engage with their professors and fellow students through video and audio conferencing. From nursing to physical therapy, business, and social work, you can earn an online degree or a number of certificates and licenses entirely online. As an online student, you also have access to personal advisors, online tutors, and IT support to help you get the most out of your distance education. St. Catherine University in Minneapolis, Minnesota, is a private Catholic, liberal arts institution with associate, bachelor's, and advanced degrees available entirely online. In addition to traditional online majors, St. Catherine offers an RN-BSN nursing degree and a master's in nursing education. You can also complete a doctorate in occupational therapy or a bachelor's degree for occupational therapy assistants. While the cost of tuition varies per program, all students pay a flat-rate regardless of their location. St. Cloud State University offers distance learning opportunities for non-degree and degree-seeking students in fully online and blended formats. These rigorous online courses are taught by the same faculty and often use the same textbooks as classes on campus. This liberal arts college uses the Brightspace system to deliver more 200 synchronous or asynchronous courses a year, depending on the program. Undergraduate degree options include the Associate of Arts or Associate of Science degree, the bachelor's degree in elective studies, and a nursing RN-to-BSN program. You can also earn a graduate degree in any of St. Cloud State's 17 online degree programs. Distance learners have access to online tutoring and pay flat-rate tuition. Graduate students may transfer up to 10 semester credits from other accredited universities. Undergraduate transfer students must complete at least two semesters and 30 credit-hours at St. Cloud State to be eligible for graduation. Concordia University-St. Paul is a liberal arts college with extensive online and blended degree options. From associate to doctoral degrees, you can find a fully online program that works for you. Concordia's master's degrees in education stand out, with specializations available in educational leadership, special education, and educational technology, as well as a K?six teaching licensure program. Concordia also offers a less common online Master of Fine Arts in Creative Writing. Courses are asynchronous and delivered through the Blackboard online learning system. Online students pay in-state tuition. How can I find which online colleges offer the degree I'm looking for in Minnesota? According to a 2016 report from the International Postsecondary Education Data System, the most common online bachelor's degrees offered in Minnesota include: Business administration and management, healthcare administration/management, accounting and criminal justice. Students can look at the Minnesota Office of Higher Education to find a complete list of online colleges located in Minnesota including location information. Bigger schools in Minnesota will typically offer a larger range of degree plans online, such as the University of Minnesota Online. Students interested in pursuing an online degree might also try investigating Distance Minnesota, a group of four colleges that offer a shared course catalogue and ongoing support for students. Which online schools in Minnesota will accept my transfer credits or work/life experience? Some students may come to school with some college credits under their belt, wondering whether they will be able to transfer their prior work into a new degree program. Every college lists its own unique policies concerning which sorts of credits will transfer, and students should connect with the registrar's office to determine whether their credits qualify. Minnesota offers a helpful resource called Minnesota Transfer, a statewide guide that helps students determine who accepts transfer credits. If students possess military experience, they should check out the Veterans Education Transfer System (VETS), which allows some former and active service members to qualify their military training as transfer credit. Some universities also convert work experience into credits, such as Walden University, where certifications such as certified public accountant, board certified teachers, and IT certifications translate to credit. When in doubt, contact the admissions office at your school of choice. How Much More Do College Grads in Minnesota Make? In Minnesota, salaries increase with jobs that have higher minimum degree requirements. Those working jobs that required a minimum of a doctoral degree earn significantly more than their neighbors who working in positions that require an associate-level degree. For average wages at all degree levels in Minnesota, see below. The Minnesota Employment and Economic Division projects an increase of 8 percent in total jobs between 2014 and 2024. The department has also released a helpful tool for students known as the Graduate Employment Outcomes tool, which offers economic information for how recent graduates perform in the Minnesota job market. This shows two-thirds of Minnesota’s college graduates found employment a year after graduation. Some of the fastest-growing careers in Minnesota requiring a bachelor’s degree include jobs in the information technology, software, mental health and engineering fields. These industries are projected to grow faster than the national average of 5 to 7 percent and are expected to see growth in the state between 5 and 20 percent annually. The fastest growing industry in Minnesota by far is in software development, which has a projected growth of 23 percent annually. Online learning enjoyed an enormous growth spurt from 2003 to 2010 and it shows no signs of slowing. Students now consider online education equal to on-campus education, and for good reason: more online colleges are accredited than ever before. Accreditation serves as a school's way of demonstrating that they offer quality education that meets high standards, all approved by an independent, non-government agency. Regional and National Accreditation: Accreditation at the regional and national levels are important to determine the quality of education given at each online school. Most colleges in Minnesota hold accreditation from the Higher Learning Commission or the Accrediting Commission of Career Schools and Colleges. Subject-Specific Accreditation: Certain degree programs will require their own subject-specific accreditation. Some possible accrediating bodies in Minnesota include: the Accrediting Council for Continuing Education and Training and the Council on Occupational Education. The Minnesota Office of Higher Education also helps prospective students determine which online programs meet accreditation standards. Costs are a big concern for any student going back to school, but students who want to try online education in Minnesota are uniquely positioned to take advantage of specific programs designed to help students better afford college. Minnesota serves as one of 12 member states which participate in the Midwestern Higher Education Compact, which entitles Minnesota students to tuition reciprocity discounts with other member states. In 2013, the Minnesota state legislature prevented significant education budget cuts and froze tuition raises for a time. Also in 2013, the state legislature passed the Minnesota Dream Act, enabling undocumented students to qualify for in-state tuition and financial aid. What are Minnesota's requirements to qualify for in-state university tuition? Most importantly: Online students in Minnesota should look at the requirements for online degree programs to see if a student must live in the state to receive in-state tuition for online programs. Are online credits more affordable in Minnesota than other places? The difference in cost between online and on-campus programs differs from college to college in Minnesota. But many colleges offer tuition reductions for a variety of reasons, so it is always valuable to check with each institution individually. Here are some variations in online credit structures in the state. Flat Online Cost Per Credit: St. Catherine University offers a flat online cost per credit rate that does not vary based on in-state residency or type of degree plan. Online Cost Per Credit, In-State vs. Out-of-State: At the University of Minnesota, students are charged a varying per-credit rate based on residency. Additionally, students taking more than 13 credit hours per semester are only charged for 13 hours worth of coursework—an incentive for students to put overtime into their class schedules to save money. Tuition Variation by Subject: Some schools, like the College of St. Scholastica, charge different tuition rates for different degrees. How can I get help paying for online college in Minnesota? Paying for college can prove challenging for students. In addition to filing the Free Application for Federal Student Aid (FAFSA), students may want to start their search for financial aid with Minnesota's National Association of State Student Grant and Aid Programs, which awards millions of dollars to students on a need and non-need basis. Minnesota State Grant: These grants from the state go to low-income students struggling to pay for college. Students can determine if they qualify by filling out the FAFSA. Eligible institutions include state universities, public community and technical colleges, schools of nursing and related health professions, private colleges, and private career institutions. Public Safety Officer's Survivor Grant: This grant caters to dependent children and the surviving spouse of a public safety officer killed in the line of duty on or after January 1, 1973. Applicants must have been enrolled in an undergraduate degree or certificate program after June 30, 2011 at an eligible Minnesota institution that participates in the State Grant Program. The fee maximums reach $14,488 for students in a 4-year undergraduate or graduate program and $5,790 for students in a 2-year program. Minnesota Teacher Candidate Grant: This grant provides postsecondary, one-term financial assistance to eligible students enrolled in Minnesota teacher preparation programs. On a funds-available basis, selected undergraduate and graduate students may receive awards of up to $7,500. To qualify, students must enroll in an eligible Minnesota college or university teacher preparation program that requires a minimum of 12 weeks of student teaching. They must also intend to teach in an identified licensed field and demonstrate financial need. Minnesota Academic Excellence Scholarship: This scholarship caters to students who demonstrate outstanding ability, achievement and potential in: English or creative writing, fine arts, a foreign language, math, science or social science. Especially for students who have put their college career on hold after high school, adult education programs can be the first step back to earning a college degree. In Minnesota, this means everything from basic refresher courses in math, English and writing to high school equivalency training and English as a Second Language programs. The U.S. Department of Education tracks measurable skill gains in adult education students. In 2016 to 2017, of nearly 39,000 students taking these courses statewide, nearly 40 percent saw measurable skill gains. Bridging the transition to earning a college degree. The Minnesota Department of Education has information on adult basic education and GED programs that can help adult learners obtain their GED and get into online college. Transferring to a 4-year college. Minnesota State offers information to students that help students transition from a community college to a 4-year college. This program is known as the Transfer Pathways program. Earning work experience after graduation. The Minnesota Works! program helps many recent college grads obtain the right work experience they need to move into more competitive jobs after obtaining their degree. Continuing education and professional development. After earning a college degree, adult and continuing education programs provide opportunities to earn additional certifications and learn new industry and business skills.